It was an amazing trip! Though jet lagged, I returned home from Italy at the end of April excited and inspired. After a brief stay in Rome, I headed right to Napoli. Before I even made it to my bed and breakfast, the Donna Regina, I was organizing for the film crew skymedia that was to arrive the following morning. While the days were long, in a short period of time, Sky, her crew and I visited and filmed four pizzerias, the Molino Caputo flour mill, a pasta factory in historic Gragnano, bufala mozzarella producers at Tenuta Seliano south of Salerno in Paestum, and three very different presentations of antipasti at various locations. I’ll start with the antipasti. In the Cilento, the Baronessa Cecilia Bellelli Baratta prepared mozzarella in carrozza, zucchine a fiammifero and one of my favorites, panzerotti filled with escarole and pine nuts. This feast followed a lovely interview with her on the grounds of her agricultural tourism establishment about the history of bufala and an early morning visit to her caseificio where fresh bufala milk is formed daily into all types of mozzarella, ricotta and yogurt. By the way, the water buffalo are very sweet animals. Zooming back to Napoli, our second round of antipasti was made at a new favorite locale of mine, Osteria Antica Pisano in the Forcella neighborhood. Chef Gennaro offered a typical plate, gently simmered octopus with fresh, local cherry tomatoes and white wine. We ended the evening in Vomero at the pizzerria La Notizia. Owner Enzo Coccia was my teacher in 2004. Enzo provided me with the foundation that has allowed me to evolve as a pizza maker. It was great to be with him once again. From the beginning of this trip, the making of pizza would be a constant focal point. Conversations that began at Molino Caputo on our first day continued at each of the pizzerias we visited. One with Enzo’s fellow pizzaiuolo confirmed my thinking. This interesting thought shared by Davide, who works alongside Enzo at the pizza bank, was how many of us outsiders come to Napoli to learn the craft, but then transform la vera pizza into something else. My friend John Arena of Pizza Metro in Las Vegas speaks of tradition as something we are in the process of forgetting, and over time becomes transformed into something new. It is my wish, however, to not reinvent la vera pizza, but to stay connected to these traditions, and to stay true to the forms and ideas of all these great masters in Naples. In other words, to continue in the essence of all I have been so privileged to learn. So it was very exciting it was for me to return to all of the pizzerias (Di Matteo, Da Michele, Trianon, La Notizia) where I have spent so much time in the past. So many of the pizzaiuoli have become friends and continue to provide me with great counsel and encouragement. I believe it is my true respect for their craft that has allowed for such intimate relationships to evolve. They all have such different styles and interpretations of la vera pizza. Some hands are gentle, others more vigorous. Some pizzas are soft, others a touch more crisp. What is common to all is their love for pizza, their pride in making it and their pleasure in the joy it brings to everyone. The last round of antipasti was filmed in the colorful kitchen of the Donna Regina. An incredible bed & breakfast near the Duomo and Spaccanapoli, it is like a home for me in Napoli. The walls are adorned with art; sculpture, antique furniture, and books everywhere. The proprietors are a lovely family, spanning several generations. Their knowledge of food, wine, geography and history is endless. Domenico Mazzella and his uncle Mario Raffone were the chefs for this final round. The theme was alici/acciughe (anchovies), the jewel of the Mediterranean. The alici were as fresh as one could find anywhere along the coast. Domenico was at the port near dawn to purchase these silver beauties directly from one of the local pescatore (fisherman). We had them battered and fried, stuffed, sautéed, and even made into little fish balls. We also had them with the pasta we brought back from the world famous town of Gragnano, the original source of artiginal maccheroni. To wash down the anchovies, we had the pleasure of a wonderful white wine, Asperinio di Aversa. This was truly a special vintage, not available to the general public. It had an unfiltered look, slightly sour and crisp, as described by Shelly Lindgren in her book A16. After my final meal with Sky and her crew, Mario, Domenico, Margherita (Domenico’s friend) and I made our way south into the Cilento, though I had just returned from the Cilento only twenty four hours before. We made our way to Palinuro, a gem set on the Tyrrhenian Sea. The entire region, the Parco Nazionale del Cilento e Vallo di Diano, is a Unesco World Heritage Site. A wonderful book entitled The Food and Wine Guide to Naples and Campania by Carla Capalbo offers a great understanding of all there is to eat, drink and experience in this area. The countryside is mountainous, the coastline is spectacular. For our first day in the mountains we stayed at the Villa Balbi di Sabino Sasso. We had a leisurely meal lasting over four hours with six bottles of wine. Everything on the table, the legumes, salumi, pastas and cheeses, was from their own land. We even had a dolce topped with a mix of chocolate, herbs and sangue di maiale (pigs blood). Their imagination brought forth delicacies fuori del mondo, out of this world. 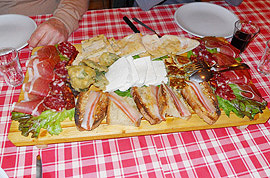 Besides their home made wine, we were blessed to enjoy a wonderful digestivo, Finochiona, at the meal’s end. I had thought this spirit was made from fennel, but it actually comes from a wild flower. The following day we were by the sea at the Taverno del Porto in Palinuro. Another four hours, another incredible meal. One cannot truly describe the taste and texture of fish just taken from the sea, it needs to be experienced! We had it all, cicinielli, alici, shrimp, baby octopus, tiny squid, tuna. Every dish was presented as art in the realm of a national treasure. So you get the picture that this was a wonderful trip. I am so thankful for all of the friends that I have in Italy. New doors are constantly being opened, every conversation leads to a new thought or desire. I could tell you about Podilico cows, I could tell you about artichokes and figs in Paestum, I could tell you about one of the greatest pizzerias, Europeo di A. Matttozzi, in all of Naples—but that will have to wait for another day. Basta per adesso!